The Steel Drum, or "Pan", is a unique instrument, and one of the most recently invented! 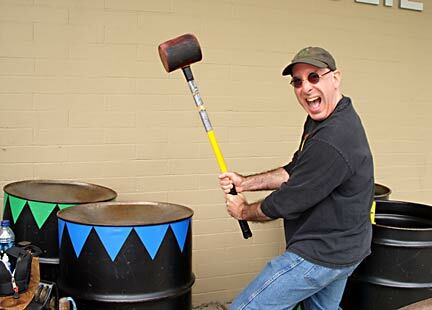 It is a skillfully hammered 55-gallon oil barrel which has been carefully tuned by hand to produce perfect musical tones. The drums were developed on the Caribbean island of Trinidad during the early years of the 20th century. Old rubbish tins, car parts and stolen garbage can lids formed the first "Iron Bands", which led to the realization that a dented section of a barrel head could produce a musical tone. Careful refinement of this amazing discovery produced the modern Steel Drum instrument and the large orchestral Steel Drum Bands, a deserved source of great national pride! Earlier on the island of Trinidad, during British Colonial rule in the late 1800's, hand drums were used as a call for neighborhood gangs to collect and 'mash up' with the other gangs. Hoping to curb the violence, the government outlawed hand drums in 1886. 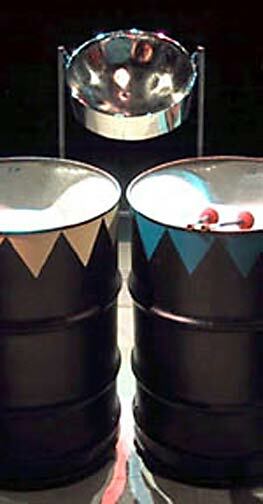 This led eventually to the invention of the Steel Drum! When two bands from rival neighborhoods met on a march, they would often stop playing and attack each other, sometimes using the bamboo instruments themselves! Soon, the government outlawed the bamboo bands as well. With no drums, the musicians of the local neighborhoods tapped & drummed on whatever they could find, including milk cans, paint buckets, old car parts, and eventually empty oil barrels (from the US Navy bases on the island). Using their makeshift instruments, the neighborhood bands reformed and marched down the streets playing the same distinctive rhythms as before. These musical rhythm sections came to be called the "Iron Band", and you can still hear them working away in the "engine room" of the modern steelband! One day in the late 1930's, after a particularly rough Iron Band session, a musical youth was fixing his barrel head and discovered that the dented part made an interesting tone. He experimented all night, and by the next day the young musician had hammered four different tones into his metal pan! 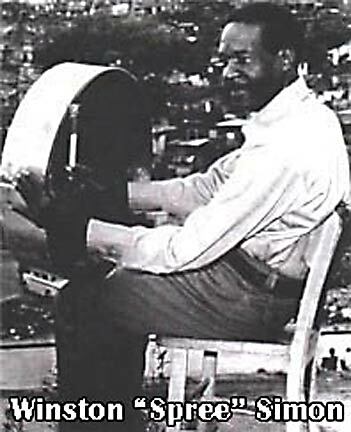 The boy whose name was Winston "Spree" Simon is generally credited with being the first person to put a musical note on a steel drum. Originally the pans were convex, like a dome rather than a dish. Ellie Mannette, another youth in the panyards of the 1930's, was the first to dish out a pan and give the steel drum its mature form. Many tuners began experimenting with producing tuned "pans", eventually forming large groups of pan players into orchestrated bands. The musical competitions which began to take place each year at Carnival quickly replaced the street fights. In 1963, the first official Panorama Steel Band Championship was held as part of the island's Independence celebration. There are two main contests at Panorama, one for the best arrangement of a popular song, and another one which showcases each band performing a fully orchestrated classical piece. More than a half century after the first contest was held, the rivalries between neighborhood steel bands still exist, but instead of fighting they battle with excellent musicianship! If you'd like to find out more about the island of Trinidad, its musical history and the origins of the Steel Drum, please visit the excellent websites at www.BestOfTrinidad.com, www.SteelIsland.com, and the very nice entry on Carnival at Trinidad & Tobago's National Library Website. This original content is ©1995-2019 by the Toucans Steel Drum Band. Please represent the Toucans as the original author if you quote parts of this article elsewhere. This article may not be reprinted in full without permission.